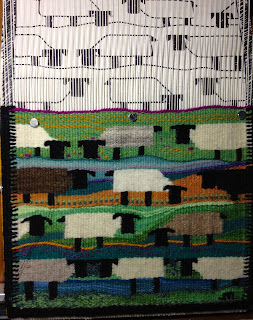 I am catching up with the sheep breed sampler. As of today my flock is half complete with twelve sheep done and twelve to go. I am sure I could carry this on even longer and include many more breeds but twenty four seems like a good group at this point. Each sheep shape is a different breed or preparation of wool for tapestry weaving and the backgrounds behind the sheep are both handspun and/or commercial yarns. 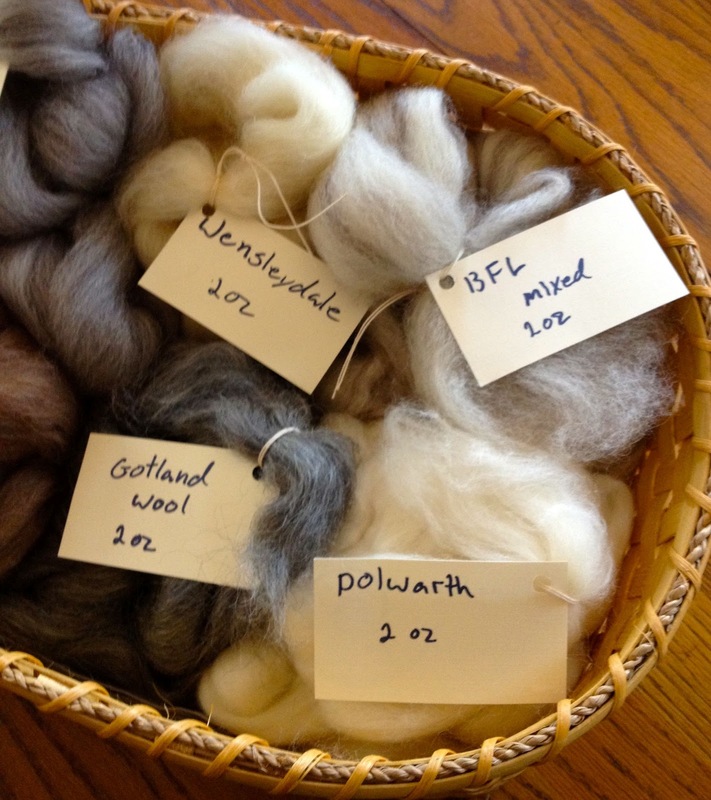 I started out with some Romney samples and since this is a breed that I had used before for tapestry I concentrated on making a few variations; combed, carded, flicked, singles and two ply. The first two sheep on the bottom are Romney samples. One is combed two ply and the other is flick carded singles. Romney is a reliable choice for tapestry and I have used it before. 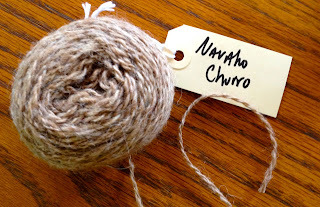 The next sheep is also a type I have used before in tapestry, Navaho Churro. This comes in so many nice natural colors that I included two samples again. One two ply in the picture and another color in singles. Navaho Churro makes a sturdy tapestry yarn. I have a couple of weft faced bags that have been well used and are still going strong and some of the natural colors give lovely subtle variations when dyed. 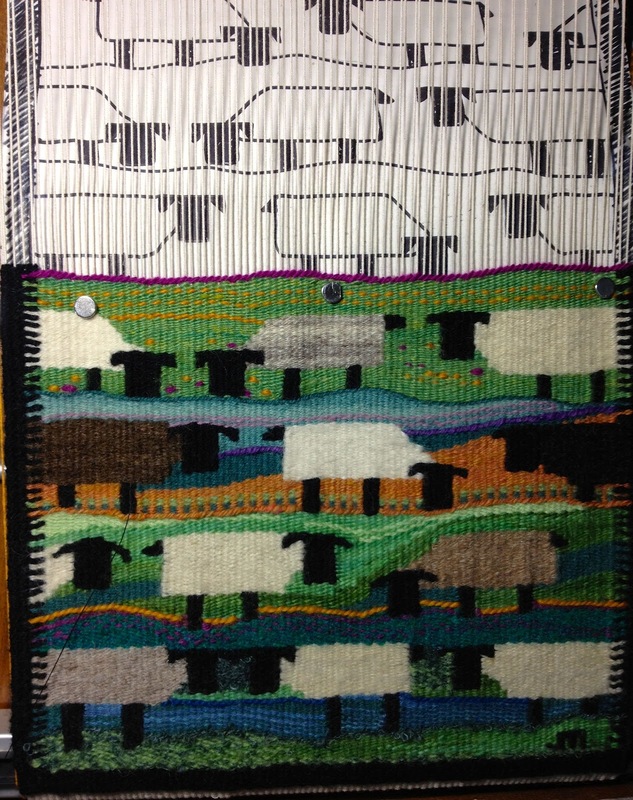 The last two sheep on the second row are Cotswald which is a fiber I have also used before for tapestry. 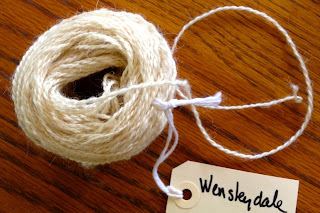 It has a beautiful sheen and dyes well, also strong, easy to spin and it is one of my go to fibers for spinning tapestry yarns. Because I was familiar with it I did several sample variations; combed, carded, singles and two ply. 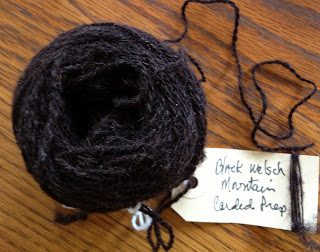 The first sheep on the third row is my black sheep woven with Black Welsch Mountain from a carded prep and worsted spun two ply. This is a very sturdy yarn and this is my first time to use it for tapestry. It seems another good candidate for tapestry items that might get a lot of use. 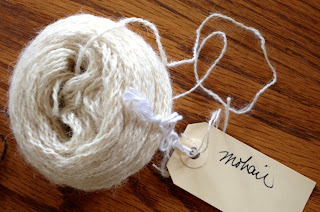 My next candidate for experiment was Mohair, not really a sheep I know but a friend had inquired whether I had tried it and I needed to know how it would work. 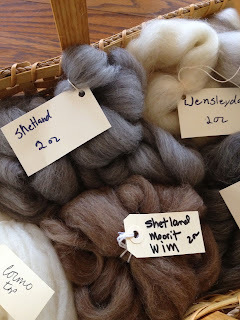 I had used small amounts of Mohair in tapestry before as a novelty in certain areas but I was curious what it would be like if I combed and spun worsted. 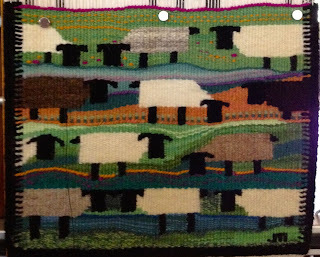 This sample is the middle sheep in the third row. This fiber is strong and takes dye beautifully and I will still use it for certain things. It may also be one that would be good to try as a blend with other fibers. Here is some Icelandic Fiber that I combed from the raw fleece and below it is worsted spun into a two ply. This was my first time ever to work with this fleece. 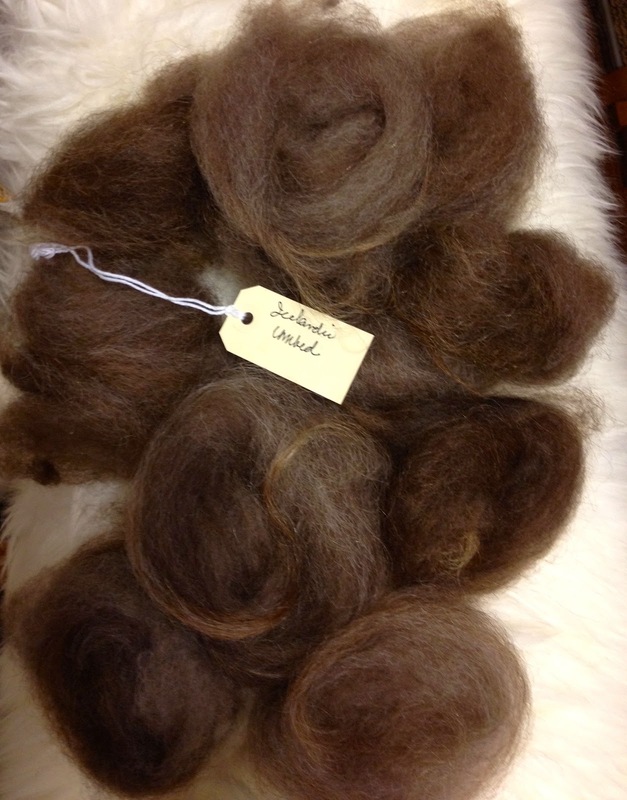 This was a fleece with quite a bit of variation in the fleece- longer stronger fiber mixed with shorter softer fiber. 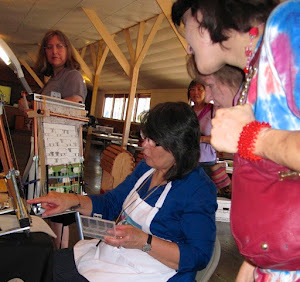 I found the natural color to be very rich with variations and I enjoyed working with it. It was a bit stubborn to weave with and tended not to stay obediently in place after beating and a little hairier than I expected so will probably not become a "go to" fiber for tapestry. It is the last sheep on the third row. Here is the Wensleydale. 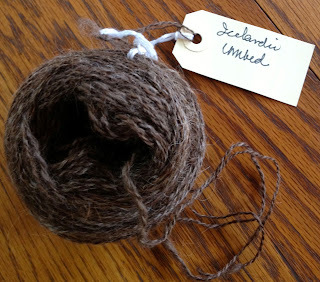 Spun worsted from a combed preparation and two plied. My sample had a nice sheen similar to the Cotswald though not as white. 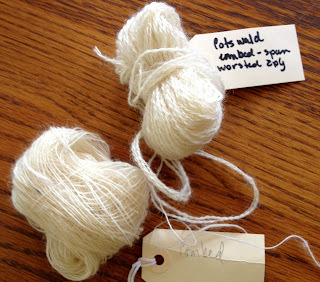 It was nice to work with and should make a sturdy tapestry yarn although a bit harder to spin than the Cotswald sample. I would use it again for tapestry. This is the first sheep on the last finished row. 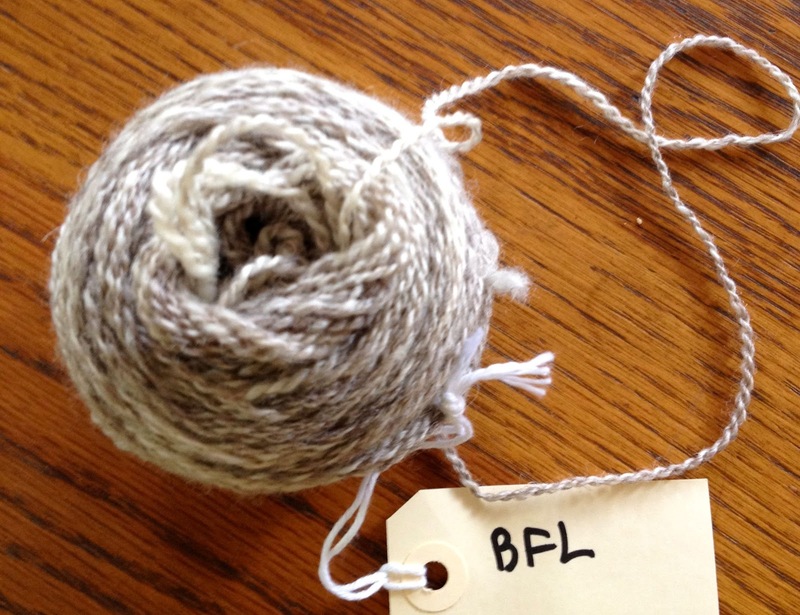 The middle sheep on the last row is BFL ( Bluefaced Leicester) What can I say, this fiber is lovely and could be adapted to many kinds of things depending on the particular fleece. 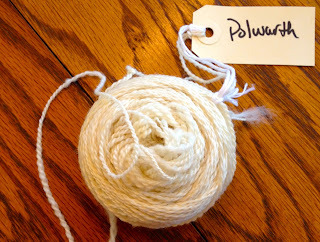 It is a nice combination of soft/strong and my sample is two ply from a combed combination of two natural colors and spun worsted. It is not too hairy which is nice and I would use it for pictorial tapestry as it is nice to weave with. Here is my sample of Polwarth. The last sheep on the last row. It is my first time to work with this fiber and I don't know what I was waiting for. It is lovely,soft/strong, not hairy, very smooth and easy to spin and weave. 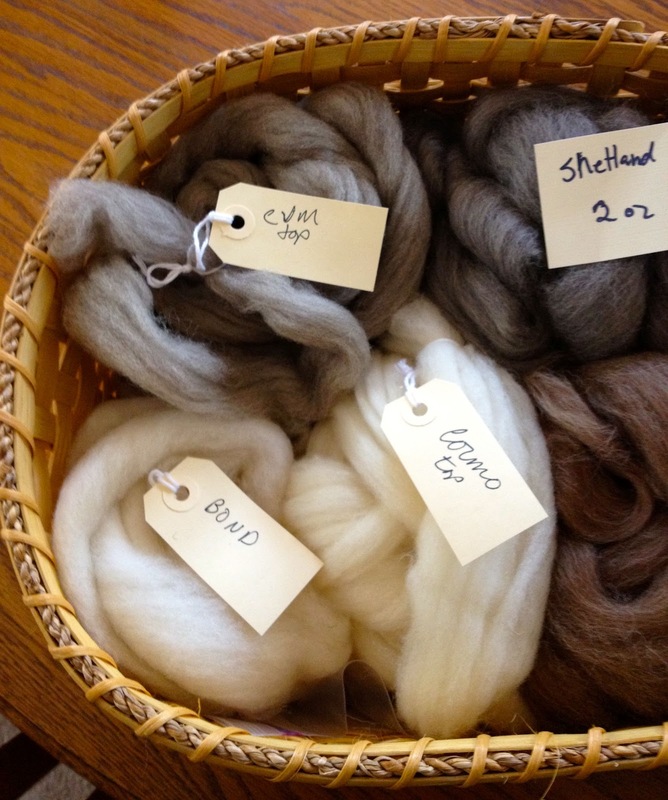 I would love to experiment with this fiber as part of a blend for my pictorial tapestry weaving, and I also want to do some dye experiments with it. A new favorite! Here is another picture of the first half of the sampler with most of the background and cartoon removed. 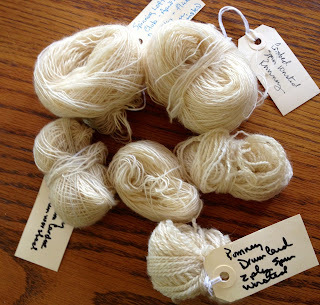 Below are some pictures of the fibers before spinning and some of the ones that are still in line to be used. I think I will be working with Gotland, Bond and perhaps Scottish Blackface next. July Tapestry Diary is Finished!